When you launch a music streaming service these days, you need to distinguish yourself from established and competing services to survive. Most services offer similar functionality, millions of songs to play, web, desktop and mobile access, and a free and premium business model. 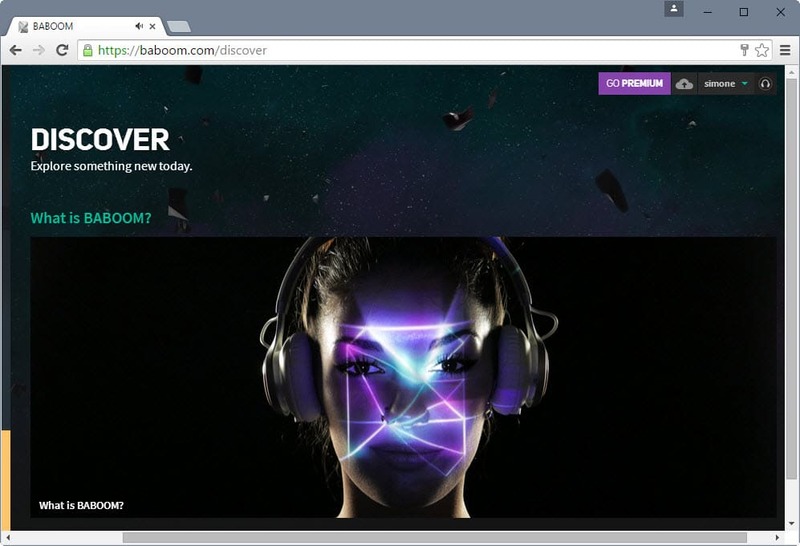 The new music streaming service Baboom launched yesterday. It looks similar to other services such as Spotify, Tidal or Apple Music on first glance as it offers free and pro accounts just like the majority of other services. One core difference is the focus on independent artists. You won't find established mainstream artists on Baboom, a search for Madonna, Metallica or The Beatles returns no hits. Artists can sign up for artist accounts and upload their songs and albums to the service. Baboom promises that 90% of revenue reaches artists and calls it fair trade streaming as stream revenue goes directly to artists. This is only the case if artists sign up for a pro account that is available for $10AUD per month and includes album and song sales. Artists may sign up for a free account instead to earn 70% from all sales and streams instead. Songs and album sales use a pay what you want scheme. Artists may set a minimum price, it can be $0 or another price, and users may pay that price or more if they want. Songs are downloaded either in FLAC or MP3 to the local system, and added to the collection automatically (purchased songs don't count against the 100 file limit of standard accounts). The account structure is similar for fans on the site (Baboom calls users fans). The free package has no monthly subscription free, supports streaming in MP3 and FLAC, is available on mobile devices and the web, and has a 100 song personal locker limit. The personal locker enables you to upload songs from your computer to the service to stream them when you access it. Please note that it is set to 50 files by default and expands to 100 when you fill out profile information. The premium package is available for $10AUD per month. It includes all standard package functionality, access to premium only content, no ads, and unlimited personal locker capacity. Premium users are charged the monthly equivalent of $10AUD if they are not in Australia. The currency is converted 1:1 which means that users from the EU pay €6.62 currently for a month of premium access. You can use the discover option or search to find artists, songs and albums. Baboom seems to use tags as well but there is no option provided to browse them other than editing urls manually. If you want to list metal bands and albums for instance, you will have to replace https://baboom.com/activity/electronic with https://baboom.com/activity/metal to do so as there seems to be no other option to do so. Playlists are supported and can be created on the fly using the "add to" functionality Baboom provides. Baboom is for people who like independent music and music discovery since you won't find mainstream music and artists covered by the service. If that's your focus, you will certainly enjoy the service especially since there don't seem to be any ads at the moment. 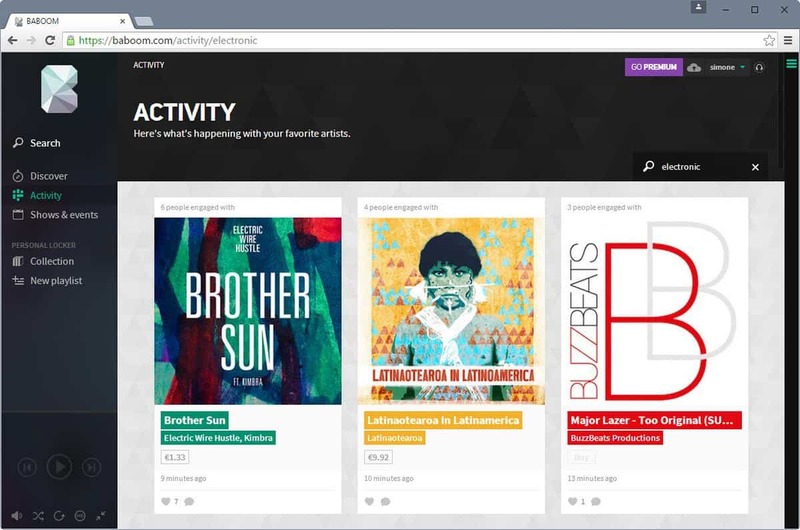 A first look at the new music streaming service Baboom which focuses on independent artists. Would be nice I guess if the site would actually play any audio. Sadly, it does not, so sticking to Youtube. Yes I have allowed all scripts on the page in uMaxrix. Seems to be a fantastic place for artists and music lovers but why is not so popular in its niche. Sites like Baboom must deserves a huge fan database. Hope in future it become the first choice for its industry. Check http://www.whoozy.net They are about to launch a new niche streaming service to help people discover the independent of the music industry. Their payout model is not stream based but user based, it’s quite different from baboom.